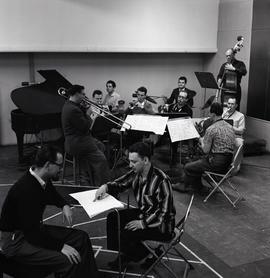 Photograph depicts Dave Robbin's Jazz band, done for CBC. 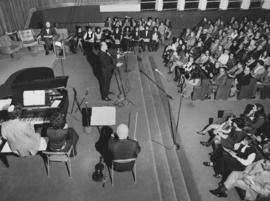 Photograph depicts George Zukerman Band for CBC. L-R: George Zukerman, unidentified, Ozzie McComb, Harvey Adams. Photograph depicts a portrait of Louis Armstrong, done for CBC, likely a photograph of a print. Signed by Schiffer. Photograph depicts Louis Armstrong, done for CBC.